"can you download videos from a camcorder to an iPad? – i would like to transfer video from camcorder to ipad but have no idea how to do it. can i directly transfer camcorder video to ipad? or do i need to convert camcorder videos before transferring to ipad?" – By sheetdiver on Apple Support Communities. Theoretically, you could of course transfer video from camcorder to iPad directly via camera connection kit, which connects your SD card to computer for video transferring from camcorder to iPad. However, we all know that most camcorders record videos to save in AVCHD file formats (either m2ts or mts). Therefore, we actually need to firstly convert camcorder videos to MP4 or other videos that could be recognized by iPad, and then transfer video from camcorder to iPad. This guide would show you how to transfer camcorder video to iPad after converting. Log in your email with the mail account and password on your computer. Create a new mail and then click the attachment button to browse and add camcorder video after converting from your computer. You could either choose to send the newly created mail to another email account of your own or save the newly created mail as draft. On your iPad, log in your email to receive newly created and sent email that contains the camcorder video as attachment, or go to the draft tab to view the newly saved draft mail. Open the attachment and then you could choose to save video onto iPad. It is the easiest method and free solution for you to transfer camcorder video to iPad via email. However, there is a big shortcoming: the size of camcorder video might be restricted due to different mail services. And the transfer speed will greatly depend on the Internet connection performance. Open your iTunes and connect your iPad to computer via USB cable. 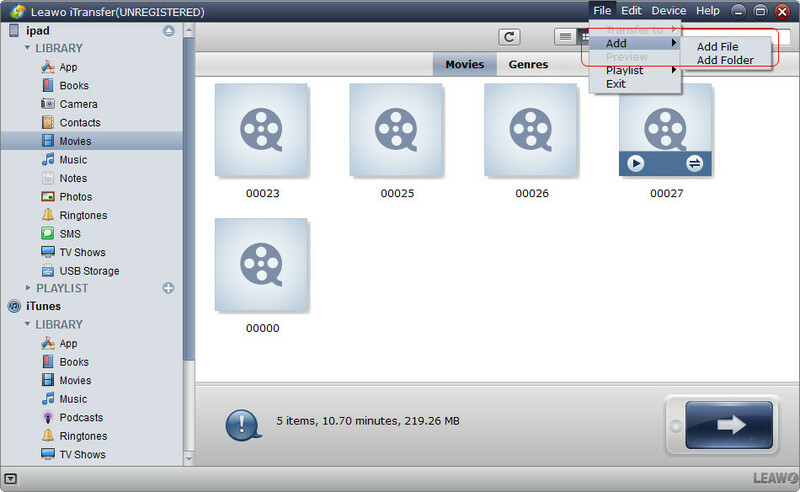 On iTunes, click "File > Add file to Library" option to browse and import camcorder video to iTunes after converting. After importing camcorder video to iTunes, click the iPad icon on the sub-menu bar. Open "iPad > Settings > Movies" tab successively. 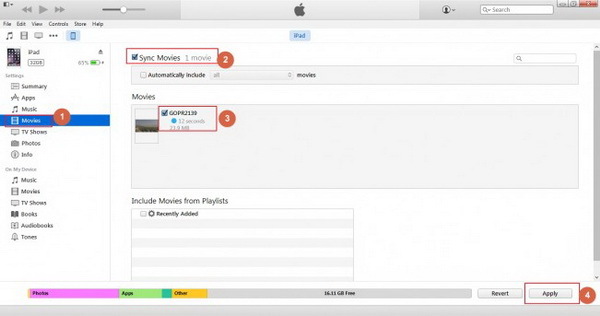 On the right panel, check "Sync Movies" option and then choose the videos you want to transfer to iPad (imported camcorder videos would appear here). After choosing camcorder videos, click the "Apply" button on the bottom right corner to start syncing camcorder videos to iPad. Then you only need to wait for the synchronization complete. Disconnect your iPad with computer and then view the camcorder videos on iPad freely. Also, iTunes is a free solution for you to transfer camcorder video to iPad for totally free. You don’t need to cost anything but time to transfer video from camcorder to iPad. It allows large file transferring from camcorder to iPad as well. However, if you transfer video from camcorder to iPad, iTunes would erase all existing video and movie files on your iPad. Is there any way that could overcome the shortcomings of email and iTunes to help transfer camcorder video to iPad without any limitaion? Of course yes. Leawo iTransfer, a professional 3rd-party iOS data transfer and manager software app, could help you easily transfer camcorder video to iPad without any limitation. As a professional iOS data transfer and manager app, it could transfer data and files between iOS devices, iTunes and computer, view data and files on iOS devices from computer, delete iOS data and files from computer, etc. With this iPad data transfer software, you could easily transfer video from camcorder to iPad tablets. Download and install this iTransfer on your computer. The below steps would show you how to transfer camcorder video to iPad tablets with this iOS data transfer software. Go to " iPad > Library > Movies" tab. You could see all existing videos and movies on your iPad on the right panel. Click the "File > Add > Add File/Add Folder" option to browse and add camcorder video to iPad from local drive. 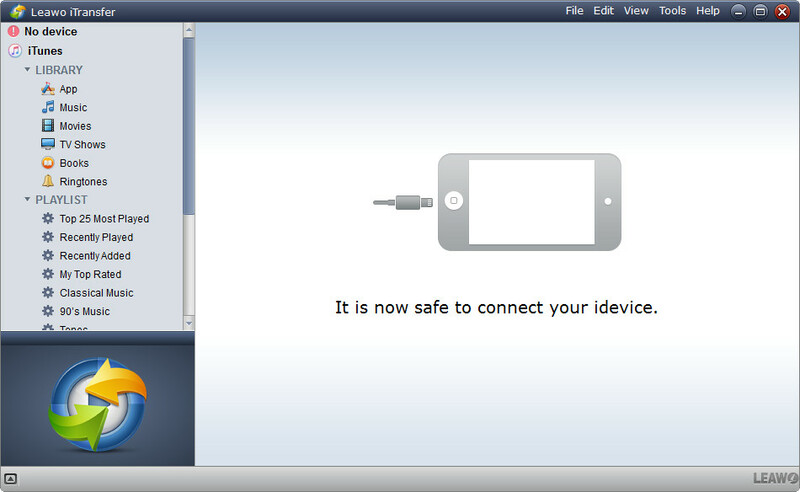 Upon camcorder video loading, Leawo iTransfer would start to transfer camcorder video to iPad immediately. You could view the whole transferring process. It will take a few seconds for the importing process to complete. Disconnect iPad with computer after the transferring is finished. Then you could freely play back and view camcorder videos on iPad. Compared with the first 2 solutions, it will be more convenient for you to transfer video from camcorder to iPad with Leawo iTransfer, since it doesn’t require Internet connection, limit file size and erase existing videos and movies on iPad neither. If you’re using a Mac computer, you could make use of Leawo iTransfer for Mac to transfer vCard contacts to iPhone on Mac.